FlowForma®, the leading provider of Process Automation tools for Microsoft Office 365®, were delighted to attend a special St. Patrick’s Day event in Horta Hall, Brussels on Monday 18th March 2019. The reception was hosted by the Ambassador of Ireland to Belgium H.E. Ms. Helena Nolan and Ambassadors to the European Institutions H.E. Mr. Declan Kelleher, H.E. Mr. Joe Hackett and H.E. Mr. Noel White, with special guests, Tánaiste and Minister for Foreign Affairs & Trade, Simon Coveney, TD. The event was attended by 800 guests and saw Irish companies discuss the recent economic growth that businesses are witnessing within the Benelux (Belgium, Netherlands, Luxembourg) market. FlowForma was privileged to present its company background and case studies face-to-face with Mr. Coveney, showcasing how its award winning, no code, FlowForma Process Automation tool is helping local customers to digitally transform. “We were delighted to invite FlowForma to one of the world’s largest business hubs, Brussels, this evening to share with us their recent growth within the wider Benelux region. We take great satisfaction in continuing to assist Irish companies with the support to drive new business opportunities in markets outside of Ireland,” said Jessica Nolan, Market Adviser, Enterprise Ireland. FlowForma attended this event with Erik Diris, ICT Manager & Data Protection Officer from Prodex North European, a FlowForma customer who’s driving digital transformation throughout its organisation, by replacing paper-based forms with online processes, to increase visibility and productivity. 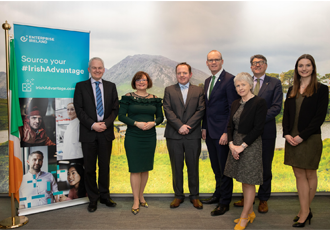 “Enterprise Ireland has been very supportive of FlowForma on its journey to empower business users, and we were excited to present our company and latest customer stories to Tánaiste and Minister for Foreign Affairs & Trade, Simon Coveney, TD. In addition to Prodex North European, we have also recently added Nipro Europe and the European Defence Agency to our ever-growing client portfolio. We are excited by the potential opportunities this region will bring in the future,” commented Keith Lally, Sales Director, FlowForma.